Summer has been a blur of activity here in Montana. We had perfect weather and NO smoke from forest fires. Yeah. We have been dyeing lots of yarn to prepare for the release of our latest Duets project in conjunction with Lorna's Laces. 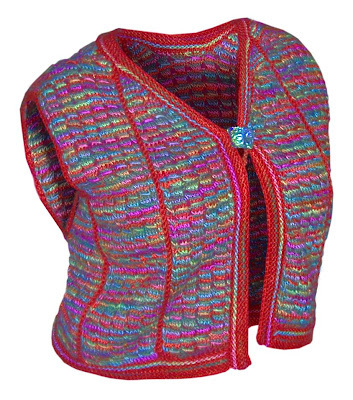 This project is a vest designed by Ginger Luters and is called the Tuscany Vest. You can order these through your local yarn shop. If they haven't heard of this kit have them call us!! It is brand new! The color of this vest is not coming through correctly and I can't seem to fix it. The vest comes in a choice of color combinations...Rust, Browns, Blue/Greens or Purples. This photo is suppose to be of the purple combo. Maybe it's just my monitor....!! Check out the Mountain Colors website www.mountaincolors.com for more information on all of the Duets projects and a better version of this photo.